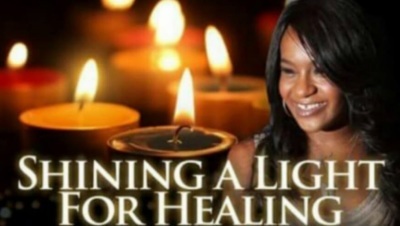 A public prayer vigil for Bobbi Kristina Brown was held Monday night in Georgia, and numerous people came together to pray for the 21-year-old's recovery. "Praise the Lord everyone," Mayor Evelyn Wynn-Dixon of Riverdale told the crowd. "Forget that Bobby and Whitney are renowned artists. They are people and they hurt and bleed like us. It's hard looking at a child on a ventilator, [knowing] what to do. If you take her off, she could have lived. No one knows what to do. On behalf of the city council, we got your back with prayers with whatever you do. Whatever troubles that baby had had, whether she never got over her mama, we pray for her." People came together at The Amphitheatre at Riverdale Town Center, which held special meaning for the family given that Bobby Brown was its first performer in 2010. The Riverdale resident's vigil was attended by members of her family as well as the public, who had been invited by the family. Her uncle Tommy offered thanks to those who came out to offer prayer. "I know she thanks y'all," he said. "Continue to pray for us all. Remember when you wake up, we should all pray for each other." The service consisted of prayer, Houston's music being played, testimony from those who experienced miracles, and the singing of hymns. In addition to Tommy Brown, Bobbi's aunts Tina and Leola attended and were seated on the stage throughout the service. "God is in the healing business," rapper Chubb Rock told the crowd. "All I see here is love. We're not here for the new world, social media. We're here for the old world, prayer. Tonight might be a good time to hug those loved ones. Don't take nothing for granted." A family source told People that Bobbi Kristina's situation was "wait and see. Everyone is praying; we have laid hands on Krissi and have been praying for a miracle. I don't know why that is so controversial. If it were your child, you would do the same thing. Where there is life, there is hope."